Recent advances in molecular and biophysical techniques, particularly fluorescence and live cell imaging, are revolutionizing the study of cell motility. New bioprobes not only reveal simple intracellular localization, but also contain details of post-translational modifications, conformational state and protein-protein interactions. Coupling these insights with complementary advances in genetic and biochemical methods is enabling scientists to understand the processes involved in cell motility - from molecular motors to cell movements in vivo in a range of organisms and cell types. This book features landmark essays that provide an up to date and fascinating account of current research and concepts in cell motility.These cover the roles of molecular motors that drive movement and their interactions with the cytoskeleton as well as membrane dynamics that allow cells to change shape and to move. Cell motility plays a key role in development - there are chapters on the genetics of cell migration, the regulation of contact repulsion in growth cones, and the progression from cell migration to cell-cell adhesion. Cell motility is directional - experts describe the molecules that regulate chemotaxis, allowing cells to migrate along pathways specified by chemical gradients. Finally, cell motility can be perturbed by mutation--metastasis occurs when cells lose their normal intercellular interactions and invade other tissue types. All these processes are regulated by signals from the environment, including other tissues in the body, and the various molecules that transmit and transduce these signals are discussed. This book is a 'must read' for cell biologists working in a variety of fields, from development to wound healing, at all levels - post-doctoral fellows, post-graduate students and lab technicians. It is also stimulating reading for molecular and developmental biologists, biophysicists and biochemists. Anne Ridley is the editor of Cell Motility: From Molecules to Organisms, published by Wiley. Michelle Peckham is the editor of Cell Motility: From Molecules to Organisms, published by Wiley. 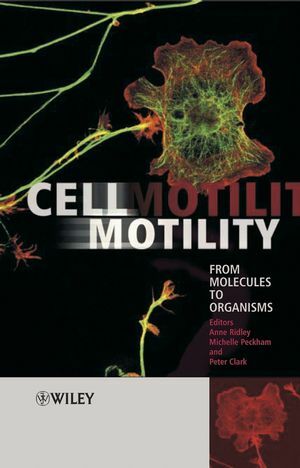 Peter Clark is the editor of Cell Motility: From Molecules to Organisms, published by Wiley. 1. Molecular mechanisms regulating actin filament dynamics at the leading edge of motile cells (Thomas D. Pollard). 2. The Role of Talin and Myosin VII in Adhesion – A FERM Connection (Margaret A. Titus). 3. Do class I myosins exert their functions through regulation of actin dynamics? (Thierry Soldati and Claudia Kistler). 4. Ephrin regulated contact repulsion of growth cones (Lene K. Harbott, Daniel J. Marston and Catherine D. Nobes). 5. Interplay between the actin cytoskeleton, focal adhesions, and microtubules (Christoph Ballestrem, Natalia Magid, Julia Zonis, Michael Shtutman, and Alexander Bershadsky). 6. Initial Steps from cell migration to cell-cell adhesion (Jason S. Ehrlich,W. James Nelson and Marc D. H. Hansen). 7. Using bioprobes to follow protein dynamics in living cells (Mark R. Holt, Daniel Y.H. Soong, James Monypenny, Ian M. Dobbie, Daniel Zicha and Graham A. Dunn). 8. Actin Filament Assembly: The Search for a Barbed End (Craig F. Stovold, Stewart J. Sharp and Laura M. Machesky). 9. Role of WASP family proteins in cytoskeletal reorganization and cell motility (Tadaomi Takenawa and Shiro Suetsugu). 10. Regulation and function of the small GTP-binding protein ARF6 in membrane dynamics (Thierry Dubois, Emma Colucci-Guyon, Florence Niedergang, Magali Prigent and Philippe Chavrier). 11. Chemotaxis of cancer cells during invasion and metastasis (John Condeelis, Xiaoyan Song, Jonathan M. Backer, Jeffrey Wyckoff and Jeffrey Segall). 12. Dynamin and cytoskeletal-dependent membrane processes (James D. Orth, Noah W. Gray, Heather M. Thompson and Mark A. McNiven). 13. Regulation of microtubule dynamics in migrating cells: a new role for Rho GTPases (Torsten Wittmann and Clare M. Waterman-Storer). 14. Calpain regulation of cell migration (Anna Huttenlocher). 15. Role of villin in the dynamics of actin microfilaments (Rafika Athman, Sylvie Robine and Daniel Louvard). 16. Scar, WASP and the Arp2/3 complex in dictyostelium migration (Simone Blagg and Robert Insall). 17. Directional sensing: subcellular targeting of GPCR downstream effectors during chemotaxis (Satoru Funamoto and Richard A. Firtel). 18. Cell crawling, cell behavior and biomechanics during convergence and extension (Ray Keller and Lance Davidson). 19. Regulation of cell migration in vitro and in vivo (Donna J. Webb, Karen Donais, Shin-ichi Murase, Hannelore Asmussen and Alan F. Horwitz). 20. Genes that control cell migration during mouse development (Carmen Birchmeier).